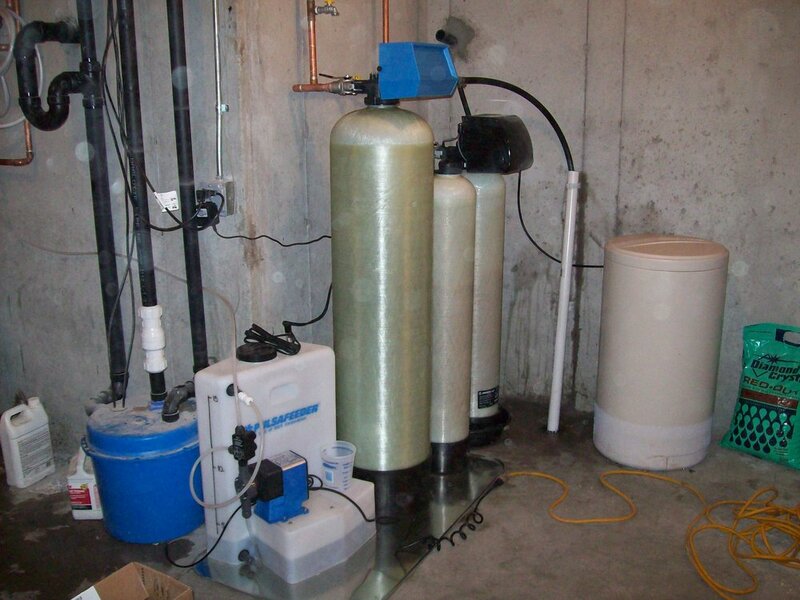 Basic backwashing filter and twin tank arsenic treatment system. Twin tank automatic filter followed by twin tank softener. This version treats all the water 24/7/365 with no interruptions even during backwash sequences. No time clocks to keep setting after power outages. Treating high levels of iron, pH, manganese and hardness. Twin tank high efficiency softener that treats the water 24/7/365 with no interuptions or time clocks to set after power outages. 1600 gallon per day Reverse Osmosis system with storage tank and high efficiiency high pressure variable frequency drive pump system. Treating high levels of uranium. 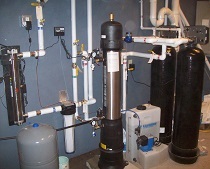 Chlorine solution feed system with carbon filter and twin tank softener. Treating hydrogen sulfide odor, two forms of iron, manganese and hardness.